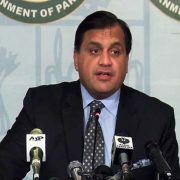 ISLAMABAD (92 News) – Foreign Office spokesperson Dr Mohammad Faisal on Thursday said that Pakistan handed over a further set of questions regarding the Pulwama dossier to Indian High Commission. “We await the Indian response to questions shared with them,” the FO spokesperson said during a weekly press briefing. He also said that India has so far not provided any actionable intelligence that could lead to Pakistan’s involvement in the Pulwama incident. He said the reply to previous questions has also not been given by India so far. The FO spokesperson said Pakistan has agreed to the technical meeting on Kartarpur in good spirit to be held on Tuesday at Zero Line in Kartarpur Sahib. He said we were also ready for 2nd of April meeting and there was no issue from our side. We will be ready in future too, as all issues can be resolved through talks only. To a question, Dr Mohammad Faisal said Pakistan has completely rejected the Indian intention of scrapping Article 370 of its constitution that guarantees autonomous status to the state of Jammu and Kashmir. The FO spokesperson said Pakistan has been consistently raising the issue of human rights violations in Occupied Kashmir at the United Nations. “If India takes any step towards the scrapping of Article 370, Pakistan will not only raise this issue at the world body level but also with India,” he clarified. To another question, Dr Mohammad Faisal said there was credible intelligence that India could launch a misadventure against Pakistan this month. He said Pakistan will respond decisively if its resolve is tested by India. He said the level of threat emanating from India is still high. On a question regarding the visit of CENTCOM Chief to Pakistan, the spokesperson said it was the first visit of General Kenneth McKenzie to Pakistan after assuming his charge. To another question, the Foreign Office spokesperson said Pakistan will not be part of next round of talks between Taliban and the US in Doha this month. There will also be an intra-Afghan dialogue on 14th and 15th of this month, organized by Russia.